SOLD- WAS: $70.00 NOW: $51.00 Brilliant color is on display here. 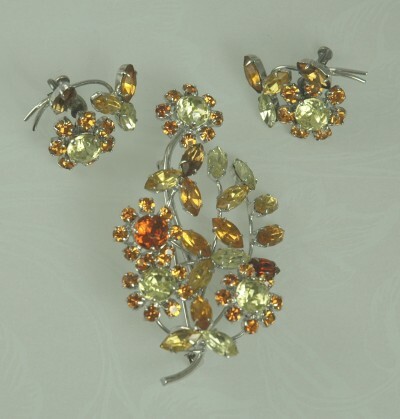 Light and darker topaz rhinestones along with rhinestones in citrine dorm the intricate floral pattern on both the brooch and the screw- on earrings. The rhinestones are all prong set. The earrings are marked sterling. The matching brooch has a very faint mark that I believe also says sterling. Condition: Excellent. Measurements: Brooch: 3" long and 1 1/2" wide. Earrings: 1" in diameter.